For the discerning purchaser looking for the latest in fashionable, functional alpaca clothing and accessories, please check out our Alpaca Delights Gift Gallery. 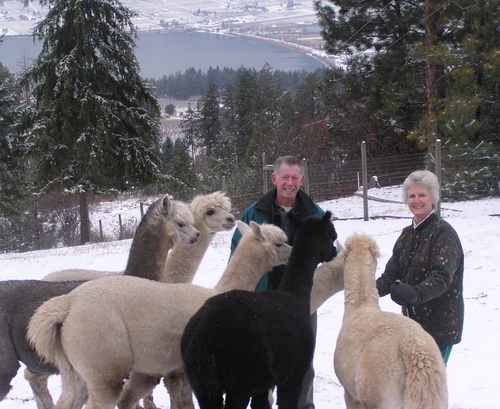 Here you will find a wide variety of alpaca products. Alpaca fibre is soft, supple, strong, resilient, and offers 22 natural colours. It is also seven times warmer than sheep's wool without the weight or 'itch' factor of wool; thus it is very comfortable next to the skin. It is lanolin free and hypoallergenic. 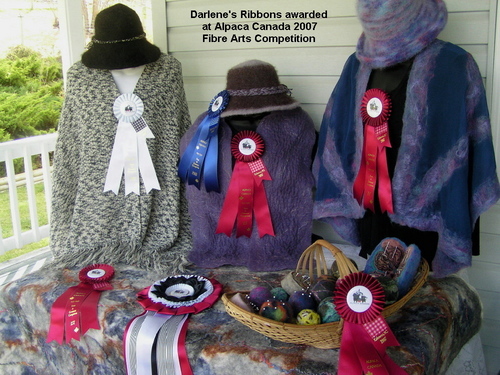 Darlene is a true fibre artisan. Her knowledge and expertise in spinning, weaving, dyeing, machine knitting, and dry, wet, and laminate felting ensures that all our products are of the highest quality and workmanship. The majority of our items in the Gift Gallery are locally made in the Okanagan by talented artisans. Darlene prides herself on keeping current with the latest trends and techniques to ensure new and exciting products are available. For the fibre artisan looking for alpaca rovings and yarn, please check out the current inventory in our Alpaca Delights Gift Gallery. Whether you are looking for a couple hundred grams for your first project or require yarn for an heirloom handwoven throw, our farm may have what you are looking for. Open All Year by appointment, please.